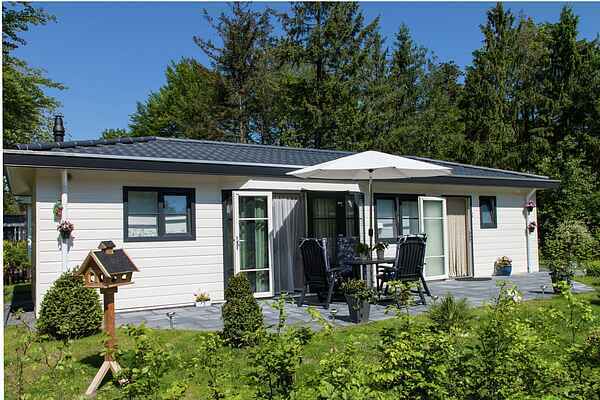 The 4-person Drakensteyn variant (NL-8346-31) and the 6-person Soestdijk variant (NL-8346-30) are comparable chalets. Both detached accommodations are spacious, comfortable and well equipped. Since the living room is in the middle of each chalet, this is quite literally the centre of activity. The 6-person variant has 3 bedrooms of course, while the 4-person type has 2 bedrooms. Since they are not situated on the woodland pond, they are perfectly suitable for families with young children. NL-8346-31 is in a tranquil setting on the edge of the forest. NL-8346-30 is situated close to the campground area, where the kids will find plenty to amuse themselves. Each variant has its own garden and terrace with garden furniture.